Japanese soda company Otsuka is about to take “one giant leap” for advertising. The moon’s surface, once described by Neil Armstrong as “magnificent desolation,” is about to become a bit less desolate thanks to a 2.2-pound titanium capsule filled with “powdered sports drink and children’s dreams,” which the beverage maker, in partnership with Pittsburgh-based aerospace company Astrobiotic Technology, plans to bestow upon our lunar neighbor. Astrobiotic is currently in competition for the $20-million Google Lunar X prize, which will be awarded to the first company to land a payload on the moon’s surface that can travel at least 1,640 feet and transmit high-definition images back to Earth. To fund such a project and to purchase a spot on a launch vehicle (which, in this case, is the Falcon 9 rocket designed by Elon Musk’s SpaceX), the company needs sponsors, and Otsuka has offered Astrobiotic a hefty half-million in exchange for a can of its Pocari Sweat sports drink acting as a stowaway. The “children’s dreams,” which will be transported in the capsule with the soft drink, come in the form of silver disks etched with messages taken from letters sent to Otsuka by children. 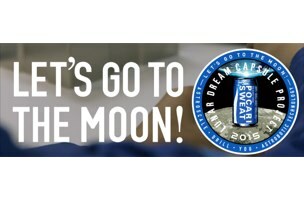 While this will be the first private trip to the moon to make a delivery for marketing purposes, effectively turning our majestic inspiration for centuries of wonder and poetry into a galactic billboard, Otsuka says it has more noble reasons for its plan — the company says it hopes the can on the moon will inspire children to strive to be astronauts so that they might be the first to crack open the can and enjoy the powdered beverage inside. All we have to say, is that we don’t think kids need a can of soda to make them want to explore the vast wonders of space, and if they do, our society is in more dire straits than we ever imagined.